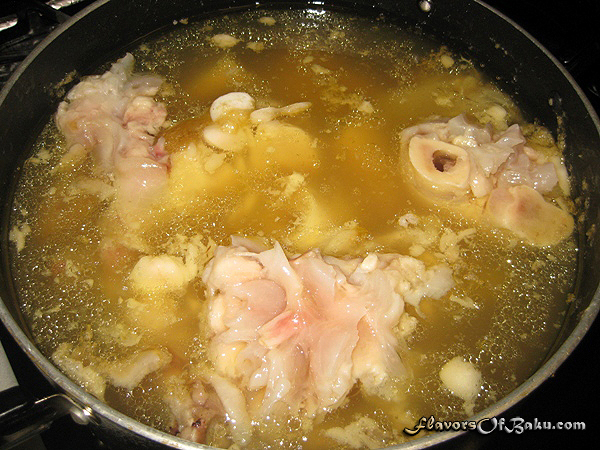 KHASH (or Xash) – cow foot tendon stew/soup, is one of the most popular Azerbaijani dishes eaten during weekends in the winter. It may not look very appealing at first, but when the tendons are cooked correctly they have an amazing, silky taste. 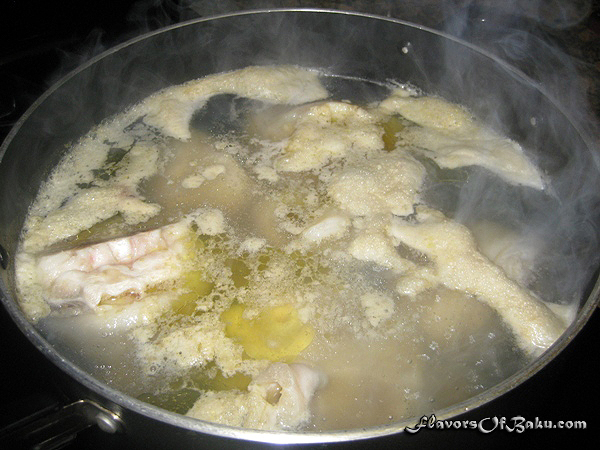 Khash has to be cooked for a minimum of 8 hours or until the tendons begin to fall off the bones and the broth becomes very thick. 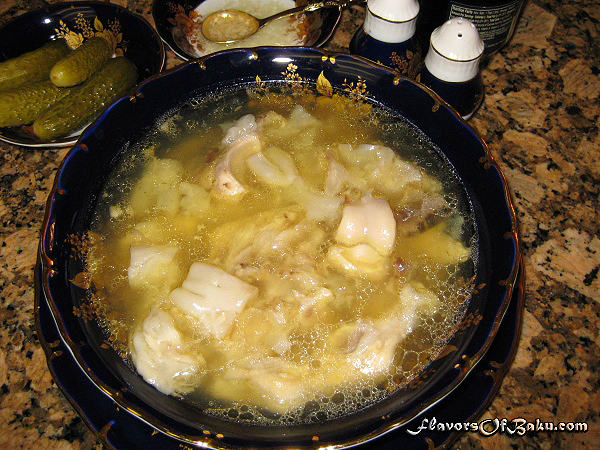 Khash is usually eaten early in the morning, which makes you full for the rest of the day. Cow feet can be purchased at middle eastern or oriental markets, where they are usually cleaned, cut into pieces, and packed for your convenience. 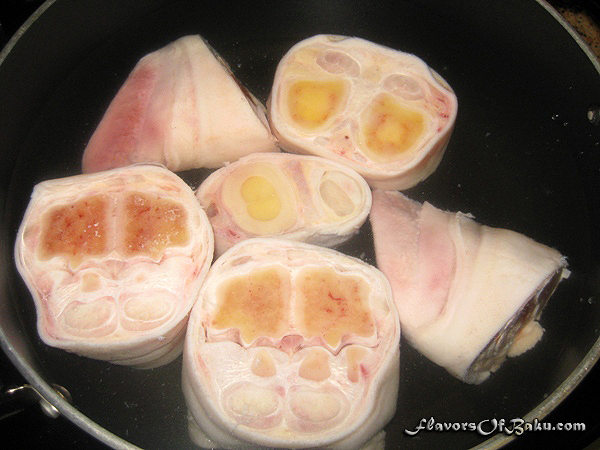 Clean and cut the cow feet into large pieces (use only front feet because they taste better and more tender than back feet), place them in a large pot, fully cover with cold water, and bring it to a boil over medium-high heat. As soon as the skim rises, remove the feet from the pot, wash them under running water to remove any skim from them, and put them aside. Pour out the dirty water with the skim and wash the pot. 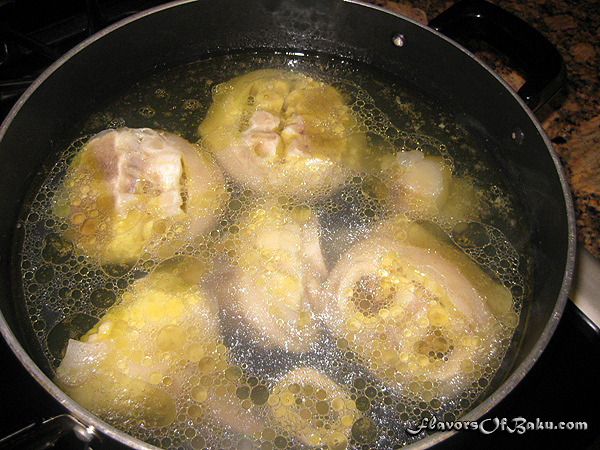 Place the pieces of cow feet back into the pot and cover them with hot water, filling the pot up to the top. Simmer over low heat for 8-10 hours. At the beginning (for a couple of hours), the feet tendons will be very hard, but will soften and shrink over time. Below is a picture of Khash after two hours of cooking. 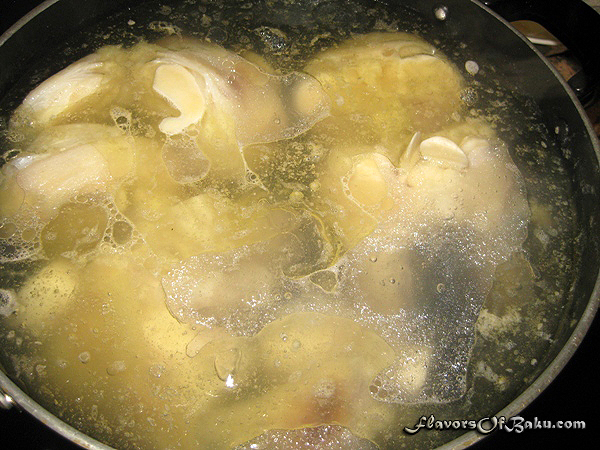 Cook until the water has turned into a thick broth and the tendons fall off the bones. 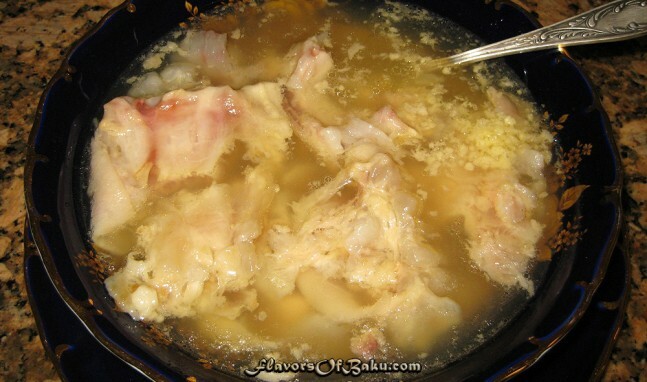 For a nice and clean broth DO NOT let the water boil and DO NOT add any seasoning, otherwise, your broth will have a murky and cloudy unattractive look. Make sure that the water level is close to the top of the pot, otherwise, the pieces that are sticking out of the water might dry out and won’t be cooked through. Stir from time to time so the tendons cook evenly. Below is a picture of ready to serve Khash. Serve Khash in individual bowls while hot, with sides of crushed garlic, vinegar, salt and pepper, and everyone will add them to their taste. Separately serve the bread and pickles.